Aerial view of WTC complex taken on September 23, 2001, before clean-up operations had begun. For largest detail photo go HERE. For largest detail photo go HERE. One of the first things Mayor Rudy Giuliani, who coordinated the destruction of the steel evidence at Ground Zero, did after the attack was prohibit almost all photography at the site. Police and FBI agents were ordered to confiscate cameras on the spot, although inevitably, there were simply too many people swarming the crime scene for such a stricture to be successfully enforced. 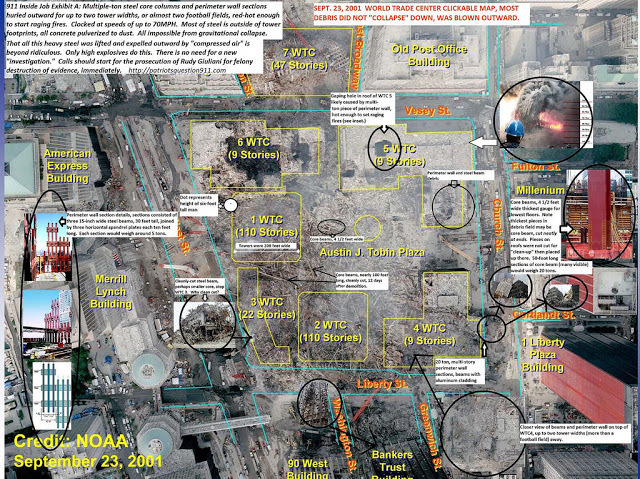 One key piece of photographic evidence that did survive the government's attempts to keep the public in the dark about what happened that day was an aerial photo taken on Sept. 23, 2001, long before major clean-up operations had begun. Rescue workers and firefighters were still primarily concerned with searching for human remains and even long-shot survivors. The clash between police and firefighters which took place as Giuliani hastened to the "scoop and dump" phase of the operation was Nov. 2. 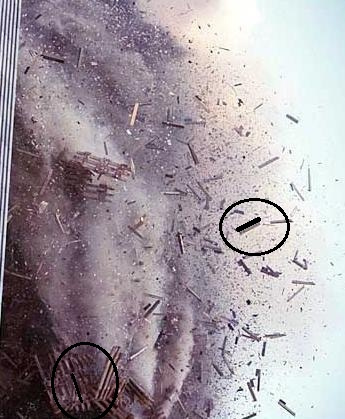 The aerial photo shows what no other photo could in such clear and convincing detail: that the towers did not collapse down through the line of gravity, but were blown outwards in all directions for two or three times as far as the towers were wide, leaving a carpet of cleanly-cut steel beams and perimeter wall sections across the entire WTC complex. No force imaginable in a downward gravitational collapse can explain the lateral ejection of steel sections with the weight of bulldozers for up to two football fields, at clocked speeds of up to 70 MPH. As can be seen in the aerial photo, the steel beam pieces are mostly straight as arrows, un-deformed by heat, and cut neatly at the ends. 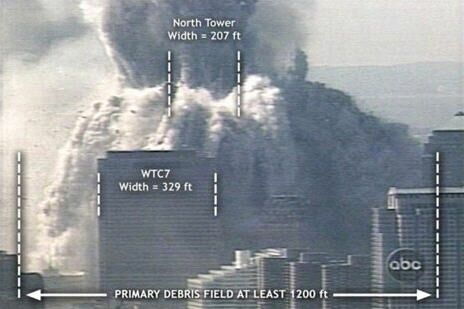 The steel beams do not wind up in a mound, as one would expect, with the center of the tower's bases as the high point, but rather scattered uniformly across the entire World Trade Center complex, which consisted of seven buildings. Perimeter sections, which consisted of 15-inch wide beam assemblies covered with aluminum cladding, can be seen lying thickly across WTC 6, nearly two football fields away. Each one of these pieces weighed up to 20 or more tons. The official NIST report explained dust ejections (what are obviously demolition squibs) by saying "compressed air" forced the dust out of breaking windows. But no amount of compressed air can lift 20-ton steel assemblies and hurl them laterally for 400 feet, at 50 to 70 MPH. Hence the reason for Giuliani's ban on photography at Ground Zero. No amount of instruction in physics or fire temperature calculations would be as dangerous to the official "collapse" theory as plain visual evidence of demolition. One need only to believe what your eyes are telling you . Steel falls down, not outward for 200 feet and more, at speeds of up to 80 MPH. The below video narrated by David Chandler gives one of the best views of cut steel beam shooting upwards and outwards, not falling down through the line of gravity. Keeping in mind the massive scale of the towers (nearly a football field wide,) it must be remembered that what seem like tiny sticks are 10 foot long pieces of two-foot wide steel beam and larger, of which even the smallest would weigh nearly one ton. Here is another view of multi-ton pieces of cut steel beams spinning away from the building as if they were toothpicks. 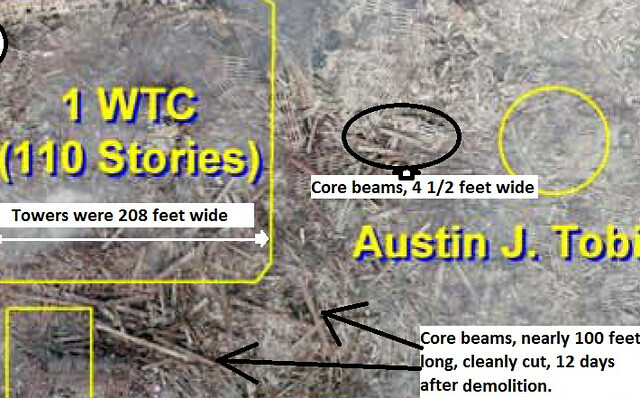 This rarely seen photo shows the width of the debris field and lateral ejections of steel and pulverized concrete debris, which can be explained only by high explosives. I agree 9/11 was an inside job but the pic you have showing the perimeter wall against wtc 4 is clearly wrong. It is obvious it was moved there via a crane. It still has chains attached. It is not fire damaged so could not possibly have been in contact with 4 as it was on fire. Looks bad. Suggest you edit it. Good job other that that.